We're coming off of the high of Sierra's wedding festivities. Before I start telling the stories (and there are lots of wonderful stories to tell) I want to take a moment to thank EVERYONE who has taken time to call, text, email (whatever) all of the kind words and well wishes that we've received. It truly has been an extraordinary time in our family and we are still floating on the love surrounding us. There were lots of memorable moments from the experience, but the story I'm about to tell you will have a lasting impact on us all. Sierra read about a lady (on the East Coast) who collects donated wedding flowers and re-arranges them into bouquets to deliver to hospital-bound patients to brighten their day. 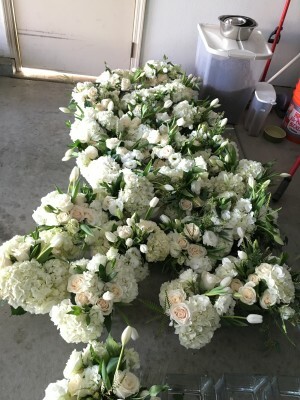 Basically, the bride/groom donate the flowers they used for their wedding day and separate volunteers do the rest of the work. Sierra commented that she wished there was a program out here (local) that did the same thing and I told her "We can do it!" And so we did. Sierra made a phone call to the Alexander Cohen Hospice House and asked permission to bring the flowers. The facility agreed. Leroy and I brought home all of the flowers the night of the wedding. It was cool enough to leave them in the bed of Leroy's truck (covered) overnight. On Sunday morning, we unloaded the flowers and friends and family began the work of removing them from the vases provided by the florist and rearranging them into smaller vases that Sierra purchased from the dollar store. When it was all said and done, we had almost 40 arrangements. Leroy and my brother-in-law John delivered the flowers (as Sierra and Joey needed to get ready to leave on their honeymoon) and the staff at the facility were astonished at the generosity. As fast as Leroy and John could unload them, staff members were delivering the flowers to the patients. I still can't believe how simple and yet impactful this project was and I've decided to start doing it on a regular basis. We're calling it the "Flower Project" (at least for now.) I've learned (from the various vendors that we worked with for Sierra's wedding) that there is a wedding "season" and not much will happen until February or March so I have some time to plan. I'm going to start an organization that will collect, reorganize and distribute donated flowers. I won't be able to do it alone so I'm asking for help. If you’d like to help with pick up, delivery, arranging, vases… whatever… We’ll take it.